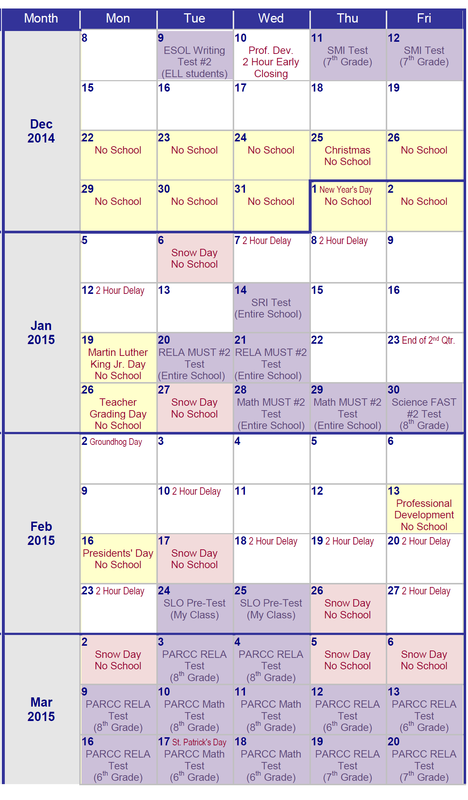 A local middle school teacher has created a calendar to demonstrate how her school has scheduled the tests required by Prince George’s County and the state of Maryland into the 2014-2015 academic year. Out of 180 school days, 55 days feature some sort of standardized testing (loosely defined here as mandatory non-teacher-generated tests) scheduled for some subset of students in the school. 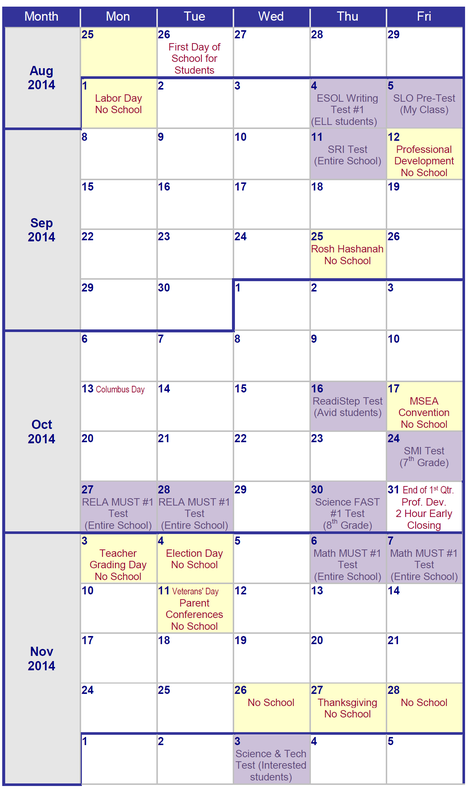 The calendar for the entire school year is posted below. Scroll to the end for brief descriptions of mandatory tests. 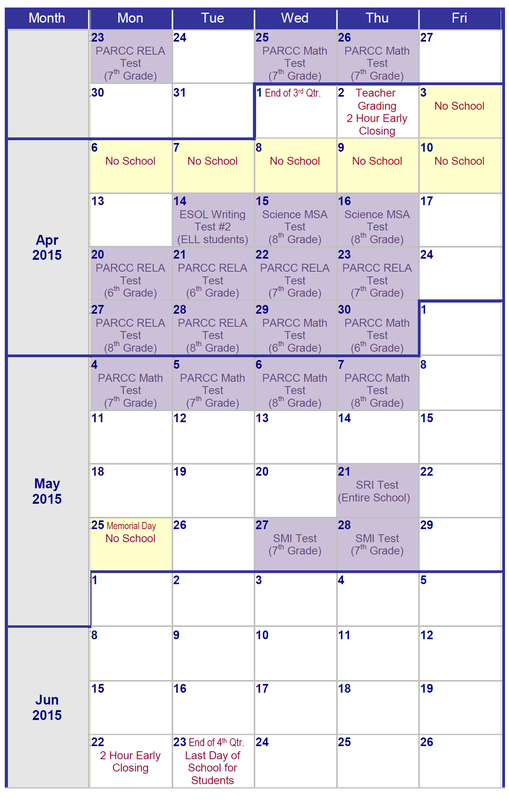 *Note that this calendar was not able to show the final exam test dates, as they had not yet been released as of April 20, the date this calendar was created. Also excluded from the calendar is the ESOL ACCESS test. The ESOL ACCESS test was administered from January 12th to February 27th as students were pulled from classes individually or in small groups. PARCC (Race to the Top/Common Core) – Computer-based assessments in mathematics and language arts given to all students used to measure college and career readiness. MUST (Prince George’s County) – Quarterly benchmarks in mathematics and language arts given to all students used to measure mastery of content area Common Core standards. SRI (Prince George’s County) – Multiple-choice reading test called Scholastic Reading Inventory (SRI) based on the Lexile Framework given to all students used to assess students’ reading comprehension levels. SLO (Race to the Top, US Department of Education) – Student learning objective (SLO) assessment (e.g. multiple-choice test, essay, student performance) used by the teacher to measure student achievement. MSA Science (MD Department of Education) –Maryland School Assessment (MSA) in Science given to 8th graders used to measure higher order thinking skills as related to science concepts in Maryland Voluntary State Curriculum. FAST (Prince George’s County) – Quarterly benchmarks in science given to 8th graders used to measure mastery of content area standards.